The concept of showering has shifted to more than just a daily routine and is now viewed as an experience. Modern showerheads not only offer the user the perfect combination between aesthetics and functionality, but also an enjoyable way to unwind and relax tired muscles after a long work day, or a rejuvenating on-your-toes experience first thing in the morning. 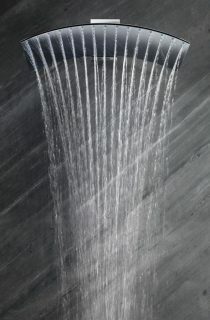 Modern showers can deliver water in a variety of ways; from handheld to fixed showerheads, to oscillating and jetted sprays, or even a combination of all four. They are not just designed with personal hygiene in mind, but also with the aim of improving the showering experience to make it as enjoyable as possible. In that case, they possess a number of options that alter the methods in which the water is delivered to the body, with systems like assorted massage options, full sprays, jet sprays, mist, rain-showers and waterfall simulations, as well as combinations of all of these to improve the showering experience. Mr Pasqual Casanova of Noken insists that, making modern a showerhead involves the use of intelligent design that maintain the aesthetics and size of the articles reducing the user’s shower area, to be able to minimize the consumption as well as the mixture of air with water to improve the sensation sought but with less water. Noken belongs to the Porcelanosa Group, and specializes in bathroom fittings. “Innovative designs, multiple functions, great attention to detail and a high value for money are our core values,” he said. 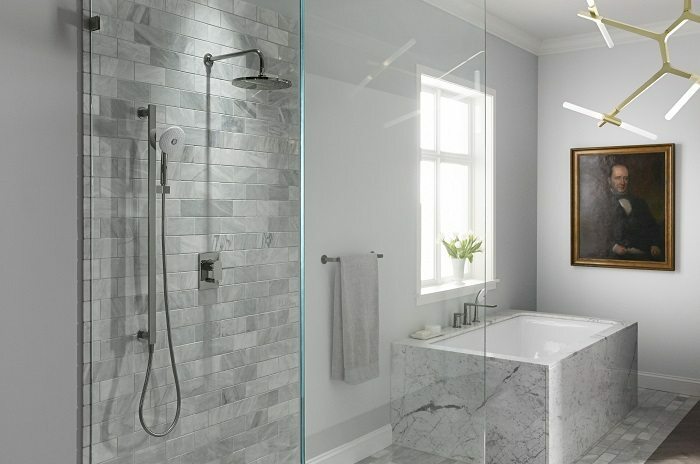 “Consumers should identify the material they may need, and carefully think of the functions they want to have in their shower head; between multiple options that include: waterfall, chromo-therapy or nebulizers,” said Mr. Casanova. Installing a showerhead flow restrictor system is another excellent and incredibly affordable idea: It can save you thousands on electricity and water consumption every year. A flow restrictor can reduce the water flow by up to 1, 34 and 1, 66 litres per minute, depending on the pressure of the water. This in turn, will also serve to dramatically reduce electricity bills, as the geyser won’t be working overtime to constantly heat up the inflow of extra water. However, flow restrictors are not advisable for showers built in areas that experience low water pressure. You could also go for a low flow showerhead, which saves water but does not interfere with the power of the water flow. A low flow showerhead does not mean you will have a weak stream of water; these showerheads possess a built-in mechanism that converts a weak pressure stream of water into a high pressure stream by combining the water with air. Although less water is used, because it is combined with air, it occasions a high pressure misty spray. There are also low flow showerheads available that do not mix the water with air. These showerheads create a shower that delivers a strong massage-like effect. The disadvantage of showerheads that aerate the water in order to increase the pressure is that this practice also lowers the water temperature. As such, if you like really hot showers, and then it is probably best to avoid aerating showerheads all together. According to Mariëtte Zietsman of Hansgrohe, ecological behaviour starts with showering and washing hands consciously. “As a champion of the value of water, Hansgrohe assumes a pioneering role in dealing with ways to conserve water in South Africa and worldwide. Our water saving taps and showers require up to 60% less water than conventional products. Lower hot water consumption means lower energy requirements too,” she said. Hansgrohe’s shower technology AirPower improves your showering pleasure while reducing your water requirement. Because air is plentiful, but precious water is not, the “We have invented AirPower, a technology that creates a balance between having fun and conserving resources,” she asserted. “The principle is simple; an ample supply of air is sucked in via the jet disc of your AirPower shower. This infiltrates the incoming water. Around three litres of air are transferred to one litre of water. Thus you will be using your valuable water efficiently,” explained Zietsman. Oren Sachs, Managing Director of WOMAG insists that, current trends show that showers are becoming a focal point in the bathroom and shower heads are bigger. 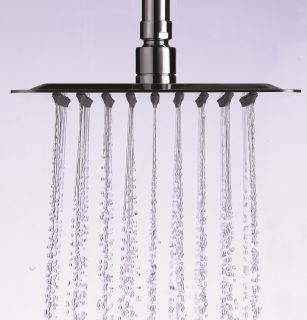 “We supply showerheads in different sizes which can accommodate any shower. The wider showerheads also allow for the water to come out softer,” said Oren. “With the current water crisis, home owners are looking for water saving opportunities and WOMAG showerheads are perfect for just that. So not only does it look appealing, but also has water saving benefits,” added Oren. It is quite essential that homeowners take their home’s water pressure into consideration before choosing a showerhead for their bathroom; since it is quite frustrating to take a shower where the water is literally trickling out of the showerhead. Today, there are plenty of designs that solve the low pressure problem, and there are some showerheads that need high water pressure constantly in order to properly function. Bill McKeone, Design Studio Manager at Kallista argues that, water flow rates are dropping lower and lower to meet guidelines and governing laws in an effort to conserve water; but when it comes to showerheads and toilets, there are no other areas where performance remains of utmost importance. “One way new technology has been able to provide a solution to achieve a more invigorating shower at a lower flow rate is through air induction, where air is blended with water to create a more substantial thrust,” he says. “We study the showering experience in great detail, including measuring the performance and effect of the shower pattern. 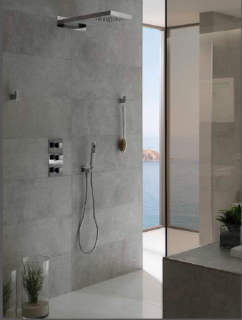 At Kallista, we measure at a 15-inch distance from the showerhead to bather impact. We also measure overall coverage at this distance to identify the type of experience enjoyed,” adds Mr. Mc Keone. He continues that, personal preference plays a big role, whether one prefers a more invigorating shower or one that creates a softer, raindrop style showering experience; showerhead face size plays an important part in this. “Selecting a six-inch diameter showerhead will naturally produce a more intense flow, while the larger face emits a softer, and more enveloping, shower. Of course, there are also showerheads where you can change the water pattern, but we have discovered that most people will keep their showerhead at one flow once they have determined the pattern they prefer,” he asserts. Modern showerheads need to look good, have great durability and perform well; as such, many models provide a number of special features that will move your showering experiences to new heights. Flow-adjusting dials: These allow you to control the water flow pressure in your shower. You can turn up the pressure for a deeper massage-type effect, or you can turn it down for a gentler flow. Showerhead filters: Built-in shower filters purify the water to ensure that you shower in the cleanest water possible. In addition to any potentially harmful bacteria, showerhead water filters also eliminate chlorine from the water, which has a negative effect on both your skin and hair, making them brittle and dry. Using purified water to shower promises to improve the elasticity and complexion of your skin; and strength of your hair. Shut-off valves: These valves aid in switching off the water flow, literally pausing it; so that you can wash yourself, your hair or shave, before switching it on again to rinse. Anti-scalding protection: If the shower is used by small children or elderly people, it would be advisable to consider anti-scald protection. 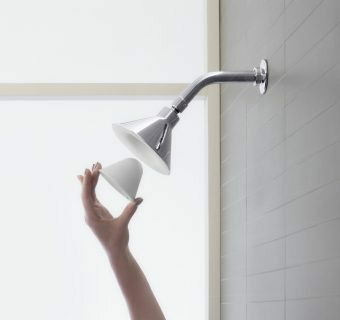 Replacing your old valve with a new one calls for some serious plumbing; however, you can go for an anti-scald fitting that can simply be installed between the shower arm and your new showerhead. Self-cleaning showerheads: The unique self-cleaning action of some modern showerheads removes clogging particles after each use. Ronelle Badenhorst Commercial Director at Kohler Africa mentioned that, the concept of showering has shifted to more than just a daily routine and is now viewed as an experience. “Older showerheads were designed on a very basic premise which ultimately meant the more water you use the better the experience,” she said. “The extensive research done by the Kohler team highlights the importance of integrating technology in ensuring that the shower experience is generated through design innovations that still guarantee a shower experience comprising warmth, force and even distribution balanced against reduced water usage,” said Ronelle. 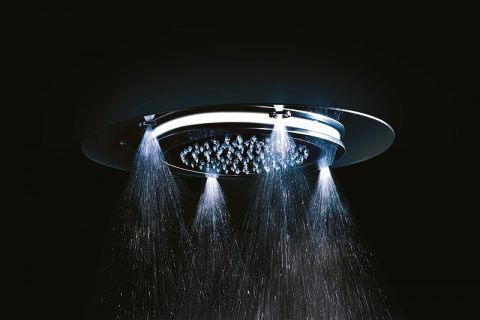 “The inclusion of the Katalyst Technology in Kohler’s range of showerheads optimizes spray performance for maximum enjoyment while reducing water consumption. 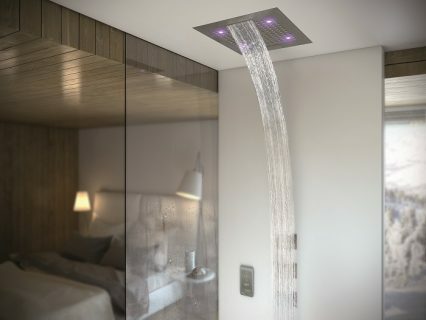 This innovative technology infuses 2.2 litres of air into 2.5 gallons of water resulting in a shower experience that awakens the senses through larger water droplets that stay warmer for longer, an invigorating forceful shower that ensures full coverage and minimal overspray,” she explained. “The Kohler Racetrack Technology a patented design is aimed at delivering the right force of water, optimal coverage and minimizing wasteful overspray. Available in a range of design and size options the use of these technological advancements is integral in creating the ultimate BOLD Kohler Shower experience,” she added. Experience – If you are looking to create an experience it is important to purchase a product that sells a holistic solution with a focus on design innovation, technological advancements, superior quality and longevity. Aftersales – The trend in most sectors is simply supply and demand with little to no consideration toward after sales. It is crucial that consumers purchases good from reputable companies with a warranty as well as technical support systems in place. Francesca Zulian of Tender rain argues that, the current shower head trends look for unique design for the bathroom as well, which is no longer a room of secondary importance within the house. “The natural rain effect guarantees a unique massage, a remarkable water saving and environmentally friendly solutions,” she reiterated. According to Maria Bossini of Bossini, they concentrate in designing and increasing the best efficiency of the water supply; that is, to optimize the consumption of water. “Furthermore, we have developed special products for low consumption of water which include: NebulizAir shower head, Fit-Air system for hand showers among others,” she said. With over 50 years of experience, Bossini is the most complete worldwide supplier of shower heads. “We strive to satisfy every request from the client and offer the best of Italian designs in terms of aesthetic research and innovative trends,” affirmed Maria. “In general, all Bossini shower heads work with low pressure, but special care is also given to low pressure installations, for example a line of thermostatic for high flow rate that work from 0.2 bar pressure,” she added. Claudia Platini of Fir Italia is of the opinion that, water saving in the bathroom obviously depends on the shower environment as well, where having the possibility to choose products that have a particular attention to consumption can really make a difference. “Thanks to the technological characteristics with which they have been designed, Fir Italia multifunctional shower heads with rain, waterfall and nebulizer jets work with only 9 liters per minute, while the shower heads with rain jet work with just 6 liters per minute. These products combine a high design content with a ‘green’ and ‘water saving’ philosophy, as well as the mixers and taps of all the collections in a modern or classical style,” he adds. Fir Italia shower heads are 100% made in Italy and they stand out for their quality, their design, their technology and the use of special materials such as DuPont™ Corian® techno surface.